The senator delivered a message of unity. Sen. Amy Klobuchar announced her 2020 presidential campaign Sunday afternoon at a rally in her home state of Minnesota. "I stand before you as the granddaughter of an iron ore miner, the daughter of a teacher and a newspaperman, the first woman elected to the United States Senate from the state of Minnesota, to announce my candidacy for president of the United States," she told a large crowd as it snowed heavily. With temperatures hovering just around 16 degrees and snow blanketing the grass of the venue at Boom Island Park in Minneapolis, supporters waved signs and American flags. 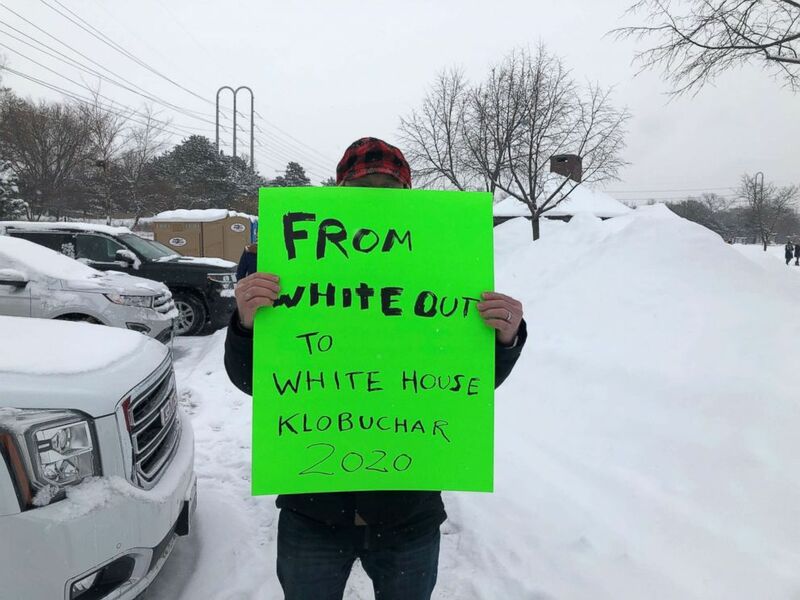 One supporter prepared a sign with the words: "From whiteout to White House." The senator spoke to a crowd of 9,000 people on what many considered a 'beautiful' day despite the snowy conditions, according to campaign aides. Klobuchar laid out an agenda including universal health care, a constitutional amendment to overturn the Citizen's United Supreme Court decision, rejoining the international climate agreement, gun control legislation and advocating for criminal justice reform. "I’m running for every parent who wants a better world for their kids," said Klobuchar. "I’m running for every student who wants a good education. For every senior who wants affordable prescription drugs. For every worker, farmer, dreamer, builder. For every American. I’m running for you." She also described her campaign as "homegrown." "I don’t have a political machine. I don’t come from money. But what I do have is this: I have grit." Perhaps in an attempt to follow in President Barack Obama's footsteps or just an unintentional coincidence, Klobuchar announced her candidacy on Feb. 10 -- the same date Obama announced his bid for the White House in 2008, 12 years ago. Two hours ahead of the event, staff began hanging blue signs with “Amy for America” printed in large white letters. A large American flag decorated the stage, its colors standing out amongst the white blizzard fog hiding the city’s skyline. “If Prince can do a halftime show in all that rain, I can do this in the snow,” Klobuchar joked. She challenged President Donald Trump to do the same. “I would’ve liked to see him out here in the snow for an hour giving this speech," she told reporters. Klobuchar is expected to deliver a message of unity, vowing to repair a country she claims is fractured. (Aaron Lavinsky/Star Tribune via AP) Sen. Amy Klobuchar speaks to the media after she arrives at the Intercontinental Hotel for DFL headquarters election night party Tuesday, Nov. 6, 2018, in St. Paul, Minn. 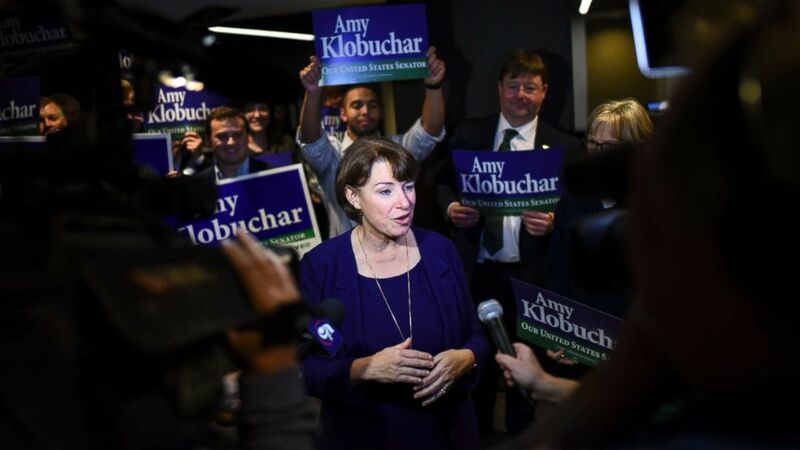 While that message is consistent across the growing roster of Democratic presidential candidates, Klobuchar stands out as a well-known Midwestern candidate in a state that has traditionally voted blue, but also has seen a decline in Democratic support over the last three presidential elections. Klobuchar celebrated a re-election victory in 2018, winning over 60 percent of the vote. Still, the counterprotesters braved the conditions to express their discontent with the senator. Mike Madden brought a sign that said in part, "No Klobuchar" calling her "the most hawkish Democrat in the Senate." "Among the Democrats I like Elizabeth Warren a lot, I think she's tough as nails," Madden said. Undecided voter Bonnie Beckel, who held a sign in support of the Green New Deal, said she was coming to see what the senator had to say on climate change. "In past I found her less than responsive to things that progressive folks want," Beckel said. (Jim Mone/AP) Snow falls as rally goers arrive at Boom Island Park for Democratic Sen. Amy Klobuchar's announcement of her decision in the race for president at a rally, Feb. 10, 2019, in Minneapolis. But tainting her big announcement on Sunday is a recent report by the Huffington Post claiming three people have withdrawn from consideration to lead Klobuchar’s campaign because of an alleged history of mistreating her staff. Following her campaign announcement, the senator responded to reports of mistreating her staff following her speech, admitting she can be tough. “I can be tough and yes, I can push people, I know that. 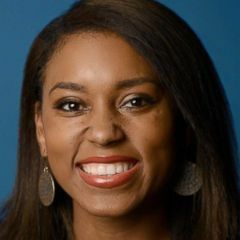 But in the end, there are so many great stories of our staff that have been with me for years and have gone on to do incredible things,” she said. Defending her morals, she added that she holds people and herself to a high standard. “I have high expectations for myself. I have high expectations for the people who work for me but I have high expectations for this country and that’s what we need. We need someone who is focused on getting things done," she said. On the heels of criticism following the report, campaign aides told ABC News the senator held an appreciation event Saturday night for staff, volunteers, friends and family. 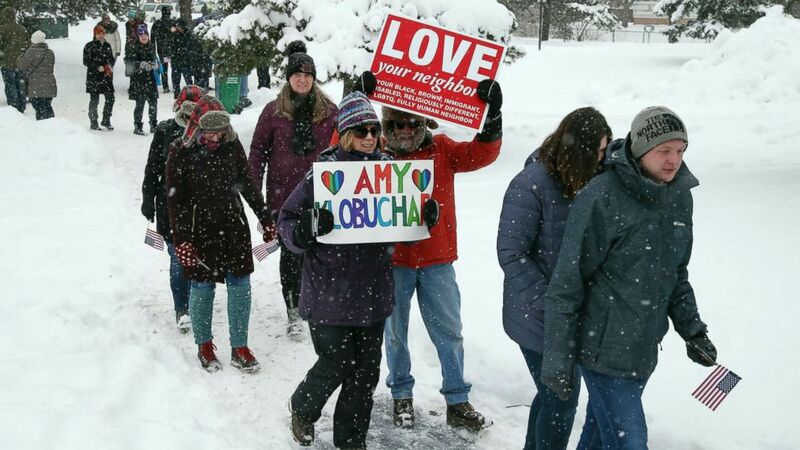 (ABC News) Supporters in Minnesota arrived in droves as Sen. Amy Klobuchar announced her candidacy for president of the United States. Feb. 10, 2019. Shillie Fisher, a local resident who is supporting Klobuchar's campaign, said she admired the senator for "telling it like it is." "She's a woman in politics, people expect a lot from here -- God forbid she asked for high expectations. If a man did that, would anyone be questioning it -- I don't think so," Fisher said.